Located in the heart of the Welsh capital, St David’s Cardiff is Wales’ leading shopping destination. 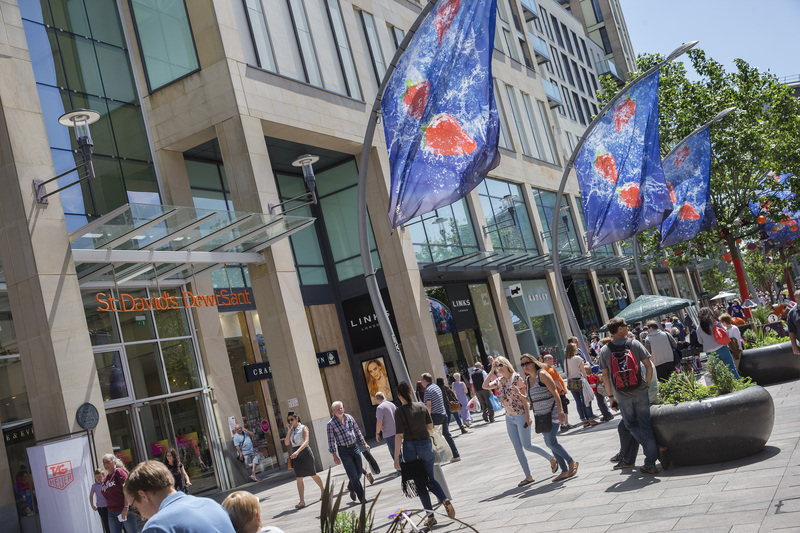 With over 40 million shoppers pouring through the doors each year, St David’s has put Cardiff city centre firmly on the map as one of the best retail hotspots in the UK. With over 180 shops, cafes and restaurants to explore, St David’s is the ideal destination for a day out – whether you’re looking to entertain the family, treat yourself to lunch or dinner with friends, or find that perfect piece for your wardrobe. Its mix of designer brands and the best of the high street makes St David’s the perfect place to indulge a passion for fashion, not to mention family retailers, interiors, beauty and pampering. St David’s has brought many exciting new names to Wales for the very first time – elevating Cardiff to one of the best places to shop outside London. Michael Kors and Victoria’s Secret opened the doors to flagship stores in Wales. There are plenty more brands that have also made their Welsh debut at St David’s, including John Lewis, Hamleys, Lego, Jo Malone, White Company, Apple, Pandora and All Saints. The centre is also home to the largest H&M in the UK. St David’s also boasts the best high-street fashion offer around, with names like River Island, New Look, Debenhams and M&S. With so many shops all under one roof, you’re guaranteed to find the perfect look! As well as being the shopping capital of Wales – St David’s also features some of the most vibrant places to eat and drink in the city, including quality eateries that will please the most serious of foodies. Packed with restaurants to suit every palette, from TGI Fridays for a family feast, to Nando’s – the pinnacle of social eating, you’ll be spoilt for choice after a day of retail therapy. The Hayes area is packed with tasty venues, including Wahaca, Jamie’s Italian and Cosy Club. St David’s is located at the heart of Cardiff city centre, a perfect place to access the top tourist attractions including Cardiff Castle, The Doctor Who Experience, the National Museum and the city’s stunning green spaces. For a fun day out, the centre is home to Treetop Adventure Golf. With two indoor, 18-hole mini-golf courses, families and friends can tackle the Tropical Trail or Ancient Explorer, and even brave the bonus 19th hole to win a free round. Throughout the year, St David’s has a calendar bustling with exciting events. From the UK’s largest student shopping event, to festive selfie stations, there really is something for everyone to enjoy. For more information on St David’s Cardiff, head to www.stdavidscardiff.com or join the conversation on Facebook, Twitter and Instagram.